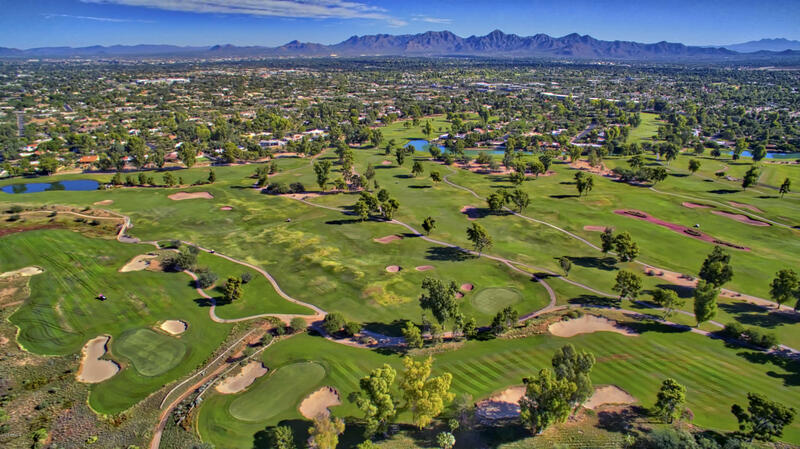 PARADISE VALLEY Arizona is home to a few spectacular golf course home ownership opportunities. Located in Scottsdale, Camelback Golf Club features 36 championship holes. Two scenic courses, Ambiente and Padre, boast native grasses, lakes, lofty trees and mountain views. The terrain, with its elevation changes, bunkers and water holes, challenges golfers of all skill levels. Play a round in spectacular fashion on your next Arizona vacation. One of two 18-hole golf courses, Ambiente Course was designed by notable golf architect Jason Straka on behalf of Hurdzan Fry Environmental Golf Design. The 7,225-yard, par 72 course challenges players with several striking features: eye-catching elevation changes and rolling fairways with significant drops. The landscape is made up of mountain vistas, native trees and wildflowers. Mindful of its surroundings, this Arizona course was specifically created to be eco-friendly and sustainable.